Former Air Canada flight attendant Marcelo da Luz has been pulled over by police about two dozen times during his travels across North America. They always let him go when he tells them about the treaties that allow his Barbados-registered solar car to use the roads legally. But the Royal Canadian Mounted Police in Red Deer, Western Canada were a little tougher than some of the other law enforcement types he’s met. They detained him for hours because he and his follow-up vehicle were traveling too slowly for their liking. The police also told da Luz that his vehicle would be prohibited from traveling on the roads permanently. The amazing thing about the rule of law is this: If a country respects the rule of law, the police just can’t make things up as they go. The police can’t make the rules, they have to obey the law or they find themselves in trouble. In this case, the law stated that a Barbados-registered vehicle MUST be allowed access to highways in Canada – so the RCMP had to let da Luz and his Barbados solar car continue on the way. Yes, da Luz promised to stick to the secondary roads during busy times – but in the end a police officer’s power was not higher than the law. 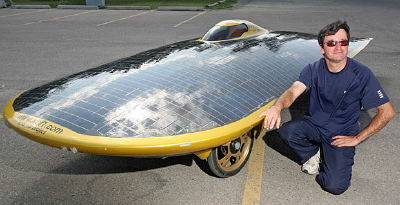 See the Canada.com article: Solar car driver resumes journey after police warning. 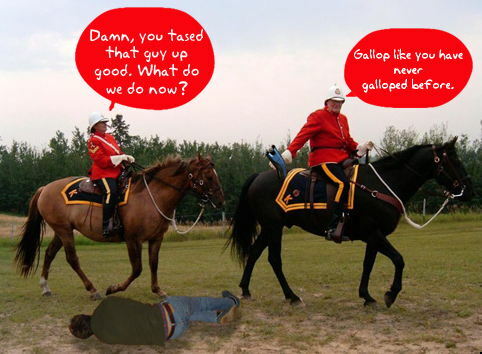 At Least The RCMP Didn’t Taser Our Friend! The RCMP are Canada’s national police force. Their name used to be synonymous with the image of dashing young “Mounties” in their red uniforms – riding on horseback to rescue damsels in distress etc etc etc. Lately though the Mountie image has been a YouTube video of RCMP officers tasering a man to death at Vancouver International Airport in October of 2007. Polish tourist Robert Dziekanski died when four RCMP officers tasered him to death for the offense of having a stapler in his hand. Dziekanski was upset after he had been waiting for 10 hours in the airport security area. He didn’t speak English and didn’t realise it was OK for him to leave. 29 seconds after the officers entered the room they tasered him numerous times. A video of the incident shows Dziekanski not attacking the officers before they killed him. RCMP Deputy Commissioner Bill Sweeney apologized for his officers making a “mistake”, but an inquiry into the man’s death was halted a few days ago (June 19, 2009) when it was discovered that all four RCMP officers lied during their testimony at the inquest. How Will Barbados Police Officers Use Their New Tasers? Every patrolling officer of the Royal Barbados Police Force is about to be issued with a Taser. While we at BFP are pleased to see our police receiving new equipment and another option that is less lethal than firearms, we have grave concerns that our under-trained, under-staffed, under-paid and under-supervised police will misuse their Tasers. If a premier police force like the RCMP can “accidentally” kill someone with a Taser, what can citizens expect from our Barbados police? According to an investigation by the CBC Canadian News, One-third of people shot by Taser need medical attention. There have also been numerous deaths attributed to the Taser and any Google search will show that Taser deaths and liability lawsuits are a hot topic. You can start with this article: The Trouble With Tasers – What the manufacturer doesn’t want you to know.